It is effective to use the flower of the orchis named Kinryouhen-Cymbidium to capture a Japanese bee easily. Only because the flower is put near the bee's nest box for capture, it is easy. Japanese bee's dividing season is about from March to May. Most during April. Japanese honeybee that escapes from the nest might be captured. Because the drone begins to act, I understand the standard at honeybee's dividing time. Even if the lid of a male beehive is seen to drop in the bottom of the bee's nest box, it comes to understand. The capture of the dividing bee is to take bee's ball into bee 's box and to capture it usually. However, the person should always observe it in this. Capture is possible only even by putting the birdhouse that is called a waiting tub. However, the method of using the flower of the Kinryouhen-Cymbidium is the easiest. Kinryouhen-Cymbidium is a kind of the Cymbidium of the orchis. It is an orchis whose stock seed of the depending Cymbidium was Kinryouhen-Cymbidium for appreciation. It is strong and an orchis in the cold grown easily though the flower is sober. 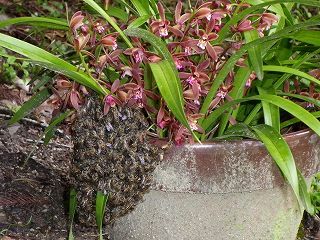 The effect of inviting a Japanese bee of Kinryouhen-Cymbidium has something that watches eyes. This is because pheromone to which the flower of Kinryouhen-Cymbidium summons a Japanese bee has been put out. Kinryouhen-Cymbidium is not mysteriously effective in the West honeybee either. When Kinryouhen-Cimbidium is put near bee 's box for capture, it is effective. A Japanese bee is invited by the flower. And, bee's ball like this photograph can be done. It moves naturally to the bee's nest box when there is a bee's nest box for capture soon to be near. "Bee's ball" need not be forcibly put in the bee's nest box. It is likely should cover with the net and Kinryouhen-Cymbidium be prevented from wilting because of Japanese bee's temperature in this photograph though the net is not covered to Kinryouhen-Cymbidium. I think that you should buy in the gardening shop to obtain Kinryouhen-Cymbidium or transfer it to keeping a Japanese bee. In the mail order, it is possible to buy it in Rakuten or Amazon, etc. It is necessary to note Kinryouhen-Cymbidium in the state that the flower is not in blossom because it is easy to confuse it with other orchises. Buying it from the trader who can trust it might be the best. It is important that Kinryouhen-Cymbidium make the flower bloom at dividing honeybee. When dividing honeybee is flowerless, it is not effective either. The flower blooms when dividing honeybee is passed when usually growing it. The cultivation technique of a general orchis is necessary to make the flower of Kinryouhen-Cymbidium bloom in the appropriate time. Because Kinryouhen-Cymbidium is almost the same as the cultivation method of the Cymbidium, I think it is good when referring to this. It is ideal to use the greenhouse to make the flower bloom according to Japanese bee's dividing time. The time of flowering can be adjusted well for a cold period of winter by indoors moving the pot when there is no greenhouse. If the flower blooms to make the flower of Kinryouhen-Cymbidium last long, you will avoid direct sunlight and move it to cool room. They can last long for two weeks or more if it does so.